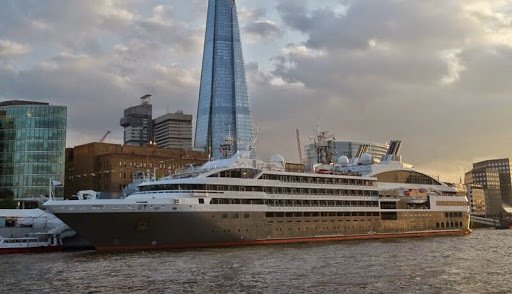 For the first time, Le Boreal from Compagnie du Ponant sails up River Thames and crosses Tower Bridge. Navigating under such an iconic touristic sight is one the most exciting travelling experience, which one has to do at least once in a life time. Just a bunch of yachting-cruising style vessels are able to do it. As usual, Capt Marchesseau welcomed us to the bridge to see part of the navigation. From the beginning with the WWII air defenses, the countryside, heavy traffic coming from Tilbury, and little quaint houses and scenic neighbourhoods. The splendours of Greenwich, the modern opulence of Docklands, and finally being saluted by hundreds of londoners and tourists as the ship crossed the bridge and anchored at downtown London.